This book is a collection of sermons by Mercer University faculty and staff preached during University Worship between 2001 and 2005. The sermons engage the ways we encounter God in our daily lives. Using themes to arrange the sermons into one of four sections, each contributor attunes the reader to the presence of the Holy in our lives and the variety of vocations to which we are called. The volume includes an essay by Wilfred Platt on worship at Mercer from the founding of the institution to 2005. CONTRIBUTORS INCLUDE: Richard F. Wilson, Margaret Dee Bratcher, Jack L. Sammons, Marc A. Jolley, Bryan Whitfield, Nancy L. deClaisse-Walford, Kay Wilson Shurden, D. Gregory Sapp, John M. Dunaway, Paul Lewis, C. Jay Pendleton, Richard C. Fallis, Darlene Flaming, Janell Johnson, W. Loyd Allen, R. Scott Nash, Mary Alice Morgan, Frank J. Macke, Anya Silver, and John Claypool. 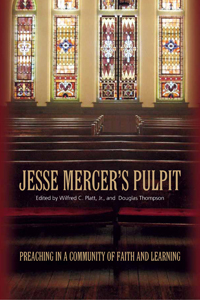 Antony Chute has provided Baptists (and others interested in 19th century religion) a very readable account of Jesse Mercer’s life – an account long overdue given Mercer’s religious influence among Baptists in the antebellum South. Chute writes about the proponent of the “doctrines of grace” most gracefully, even humorously at times. Grounding his work in fine scholarship, Chute makes Mercer a conversation partner for contemporary issues. For example, Chute’s story of Mercer’s conflict with Primitive Baptists over the doctrines of Calvinism reveals how to make scholarship accessible to all readers. The decision to include the texts of numerous writings from the pen of Mercer enhances the book.